Prior to this week’s assignment, I had never used a router before. I didn’t quite know what to expect in terms of difficulty, but ultimately it was a pretty straightforward process, slowly ratcheting up the bit with each pass until the piece was finally done. And I think it wound up looking pretty good. Take a little sandpaper to the edges, and I had a nice-looking little circle with a segment cut out of it. Apparently, we were meant to be focusing on the outside part of the circle. Which I didn’t quite understand until I saw the final segment of the assignment in which we were instructed to cut out the 1’x1’ square from the original piece of plywood. 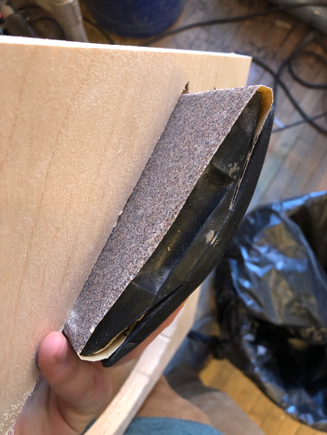 And this is a bit of an issue for me, given that as I was focused on the inside piece, I had let my router go a little way into the outside of my plywood. Time for some coarse sandpaper! So now I have a fairly nice looking circle segment, and a somewhat odd-looking part cutout of a 1’x1’ piece of plywood. Ultimately this project taught two equally valuable lessons- the first being an intro to the router, and the second on the importance of understanding the assignment before starting on it.